Polka: a lively couple’s dance of Bohemian origin, with music in double meter, or so says the dictionary. People who know better define polka dancing as aerobics set to music, accompanied with beer and with no sad faces on the dancers. Summer Sundays in Central Texas are filled with the gatherings of thousands of people enjoying homemade food, fellowship and dancing to the ethnic sounds of polka and waltz music at church “picnic” fundraisers. Old school bands, such as the Joe Patek Orchestra, Adolph and the Gold Chain Bohemians, Jimmy Brosch, the Vrazels, the Bacas, Adolph Hofner, and dozens more Czech bands maintained the European musical heritage that had been brought over from the old country. After World War II, the older musicians and their followers faded with age and their fans dispersed in search of jobs, but the passion for keeping the old music alive still burned. Fewer replacements played the bandstands, the venues disappeared, and the taste of the crowds changed. Yet, bands such as the Praha Brothers, the Ennis Czech Boys, the Shiner Hobo Band, the Red Ravens, the Czechaholics, and the Dujka Brothers still carry the torch of old-time polkas and waltzes. 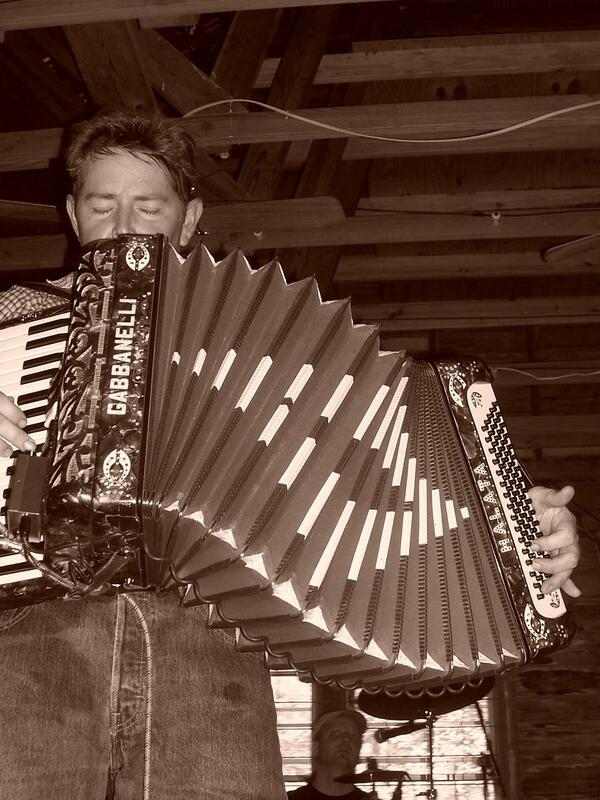 One of the most dedicated musicians determined to soldier on and keep the Czech music alive in both language and tempo, is accordionist Mark Halata and his band, Texavia. This writer sat down with Mark and asked him ten questions about his music. Why did you choose the accordion? Growing up in Houston, my sister had an accordion but abandoned the lessons. I picked it up and began teaching myself how to play when I was about six. Dad always had Czech music on the radio in the car and house, and I played along with the radio. I started playing publicly when I was eight or nine years old. When my dad would drop me off around friends, I would always turn the car radio volume down so they would not hear the Czech music. This was the mid 70s and polkas were not the cool thing to be listening to. When I was sixteen years old, a family friend took me to see a zydeco concert, and I discovered a whole new world of accordion music. Tell us about your family heritage. I am a second generation American. My granddad was born in European Moravia in 1894. [There was no Czechoslovakia until after World War I; prior to the war there were three states: Moravia, Bohemia, and Silesia.] When my grandfather was five years old, his family immigrated to Moravia [Texas] and my father was born and raised here and later moved to work in Houston to earn more money to support his family. His new home in Southeast Houston was heavily populated with similar Czech families. So, most weekends we came back to Moravia where I continued to be surrounded by Czech culture and music. At the gatherings at the Moravia Store, where Czech was still spoken, weddings, reunions, and such, people always asked me to break out my accordion and play the old songs. Is there any difference between Czech, German, Cajun, and Mexican polkas? They are all the same songs; the individual performer adds his personal touch to them. You cover a Gram Parsons [founder of the alternative country music scene in the 60s] song, which is probably not on any of your peers’ play lists, what are your influences? I love the country music of several decades ago, such as Buck Owens and George Jones. Gram helped revive that style. Jo Ann Castle [accordionist for Lawrence Welk] is also a favorite. Watching you play, at times you close your eyes and seem to go into a zen-like state. Is this a style? When I play my accordion, I just concentrate on making each song the best it can be. It’s all about the music and preserving it through quality. Do you see yourself as a leader in the Czech community of Texas? I see myself as a Texan first; being Czech makes it a little better. For years Czech was the third most common language in Texas. I belong to the Knights of Columbus, and perform most songs in Czech. Tell me about them your band, Texavia,. The band’s name reflects my feeling of pride in being Texan and Czech. The band members change due to personal schedules, as we all play for the love of the music, because the money certainly isn’t the driving force. The core members are Bruce Brosch, the son of polka legend Jimmy Brosch, and Greg Machac, whose father, Paul was a drummer for Brosch for decades. Other key members are Harlan Kubos, and Mike Gest.